During the course of Sherlock: Season Four's TV run Mark Gatiss, one of the creators, responded to a critic by way of a five-stanza poem. This course of action is entirely justifiable. 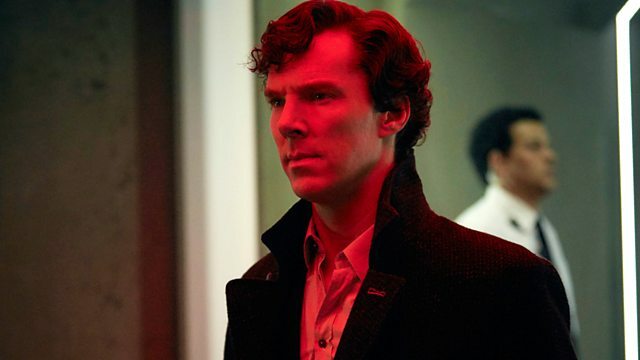 The critic in question had looked at Sherlock and decided that its main problem was the action, that Sherlock (Benedict Cumberbatch) was a bit too handy with a fists and too ready with a gun. I sympathise with Gatiss' ire. If you look at this season and decide that a bit of fighting is the main problem then you deserve entire books of verse to be thrown at you. I want to like Sherlock again, I really do, but it is beginning to resemble a show that will never again achieve the promise of its undoubtedly talented team. Season Three suggested some new substance, after the disappointing second outing, but here the show continues to move away from traditional Sherlockian values and towards something which more resembles, not Bond, but a contemporary, wordy Drama. The mysteries are getting thinner and less interesting, the time spent warbling in Sherlock's 'mind palace' have increased (and now decreased again), the time spent unnecessarily developing supporting characters we don't care about has exploded exponentially. And so, in episode one, The Six Thatchers, we get yet another story which pivots around Mary (Amanda Abbington), a character the show has singly failed to make us care about. In the terrible The Abominable Bride Gatiss and co-creator/writer Steven Moffat, tried to use Mary to make a feminist call-to-arms, instead ending up with a condescending, laughable mess. Lessons have not been learned. The development of Mary into an elite super soldier is about as convincing as the pointless section in this episode with a blood hound. What's more, the conclusion suggests that Gatiss and Moffat have realised they're on to a loser, but could find no other way out than to devote another episode to a character who should have, at most, stayed in the supporting wings. The online reaction suggests that at least most viewers were cheered by episode two, The Lying Detective. Featuring an accented, buck-toothed, Toby Jones as a megalomaniac entrepreneur, there should be a lot here to like. But again, watching Sherlock perform oratory gymnastics appears to be the episode's primary focus. Culverton Smith (Jones) seems mainly concerned with dropping double-meanings into public speeches aimed at Sherlock, which the great detective then spends time pondering at length. You can argue that the episode is a sign of a thought-through character-led series, with everyone needing space to get over the events of episode one and not being given it by Smith and his agenda. But Sherlock Holmes is nothing without a mystery and The Lying Detective's is barely hidden, let alone compelling enough to hold your attention. The saving grace of the series is the final episode, The Final Problem, which starts with ten minutes of the best TV Horror you've ever seen and continues at a cracking pace for at least the opening half hour. Gatiss and Moffat do get a bit bogged down in the middle, keeping the central trio locked in an escape room-esque escapade for far too long, but given the problems elsewhere this is at least fairly minor. Sian Brooke is a terrific villain and the season ends, as unlikely as it may have seemed, on a note of promise. That said, if Season Five is to happen, the writers would be well advised to return to a structure of 'client sits in chair, delivers case, case is solved over ninety minutes'. The first episode rankles so much partially because of the dismissive air it has towards this structure (Sherlock solves cases like this in seconds of text-on-screen overlay), a rather arrogant betrayal of the source material. If what they presented was better then so be it, but sundry other shows have managed to both solve mysteries and develop characters and Conan Doyle managed it frequently. Sherlock seems to want to do either one or the other and that one-note formula is, you feel, not long for this earth.